Welcome to another week of Travel Photo Thursday. As I’m writing this, the rain has abated here in Daejeon, but the skies are still an ominous gray. I hear thunder in the distance. I think this is our tenth straight day of cloud and rain. On the plus side the humidity finally dropped yesterday, and I no longer break out in sweat just by simply breathing  All this rain has brought back memories of Bali. I love Bali, but the rain, oh the rain. The last time I was there was 2 Christmas’s ago, and it didn’t just rain for an hour or so once daily, but steadily for hours at a time. Anyone who has experienced the rain in Bali knows that it can be like standing in your bathroom shower. However, not every Bali moment has been rainy, and here are some shots that I really love. I have never been in a country where there are so many opportunities to experience the traditional culture. I think it would be impossible for anyone to go to Bali when the locals aren’t preparing for or participating in a temple function. Travelers are welcome at these events, providing they dress appropriately. A visit to the Bali Bird Park is always one of my “Must Dos”. 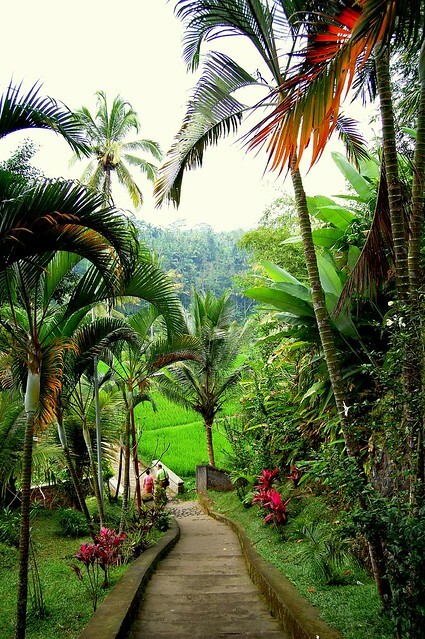 A visit to Ubud’s fertile rice paddies is as easy as opening your hotel room door, and sauntering up the street. Get caught in the rain during your wandering, and you’re guaranteed a slippery adventure! At the bottom of these many many stairs is a major Hindu temple, with 10 rock-cut candi (shrines). It’s one of Bali’s oldest and largest ancient monuments (according to LP). The day I was there it rained (HARD). That’s why the sky in this photo looks so washed out. (This was just before the downpour. 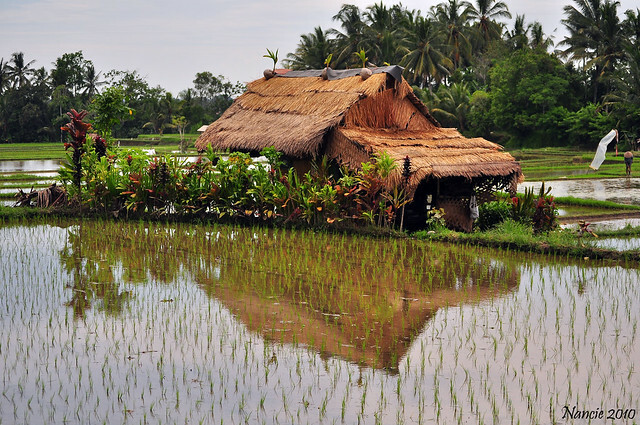 )I think the lushness of the trees and rice paddy on the right makes up for it! What would Bali be without an awe inspiring sunset? Have you been to Bali? Do you leave with a favorite photo or memory? Follow on BTS on Facebook. I love these Bali pictures especially the birds and the monkeys. Unfortunately, I haven’t enjoyed Bali yet. I hope the weather gets better for you in Daejeon. How fabulous, can’t wait to explore Bali in September – so excited and thanks for the timely tips! I haven’t been to Bali but what an inspiring set of photos. Love the hornbills and looking at the home by the rice paddy makes me once again realize how fortunate I am here. Some of your best photos I think Nancie. The last 3 pics are just how I’ve always pictured Bali. Those monkeys are unbelievably cute. What beautiful nature shots! And the animals? The one with the food in the beak is amazing. What timing! There is such a joy in looking at the bird and the monkeys and the sheer beauty of the people and the place are captured so well in these photos Nancie. Some of your best ever! 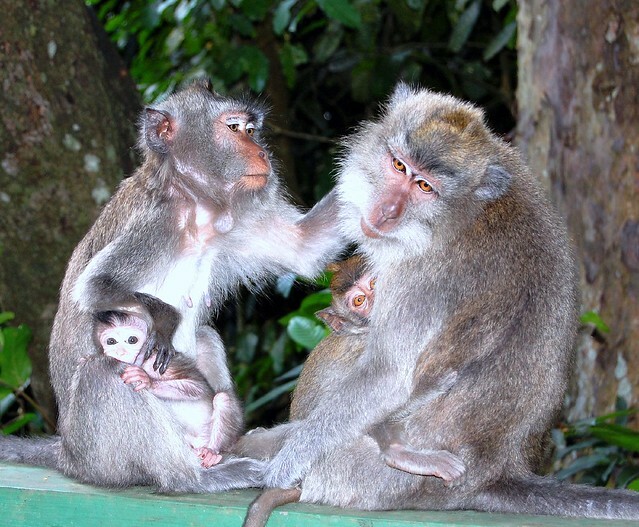 Bali is on my list, but the Ubud Sacred Monkey Forest tops my list. The baby monkeys are too cute for words! We have monkeys just like that at our local park. They tried to steal my clothes while I was in the wading pool. My favorite photo is the first one with all the ladies. I’ve been to Bali (pre-kids), but it was at the end of a whirlwind 3 week trip to SE Asia. We were so exhausted by the time we got to Bali that all we did was sit on the beach. While that was fun, I’m now sad to have missed out on the temples, rice paddies and nature Bali has to offer. My husband had actually visited there when he was a kid, and he figures that twice is enough for his lifetime. So, it looks like I won’t be headed back unless I go solo. Haven’t been in bali in so many years, but remember it was a wonderful, magical place to take small children. Especially liked Ubud, the monkey forest and the local dances with dragon costumes. Fab place. Nancie – A few more reasons for me to finally get to Bali – it looks amazing. 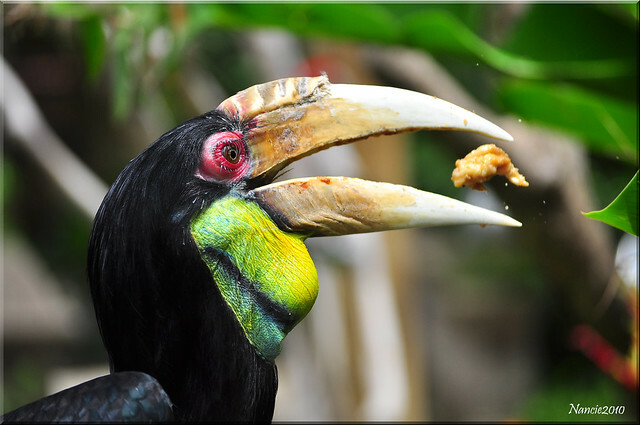 I especially love the hornbill action shot! Wishing you clear skies and sunshine! What a lovely new site design. 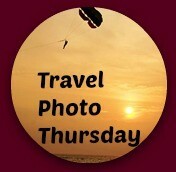 Sorry that Travel Photo Thursday is MIA, but maybe people will follow the links in comments? Hopefully. As to your photos today, I love the colors and just have to say about that first photo–when you say “dress appropriately” does that include carrying a golden vase on your head? (Sorry, couldn’t resist). I came back to visit others participating in TPThursday this morning and can’t find Mr. Linky on your site . . .hope he returns! For a summer project, my daughter and I started learning about the birds in our area, so I would definitely like to visit that bird park someday! The birds looks so colorful. 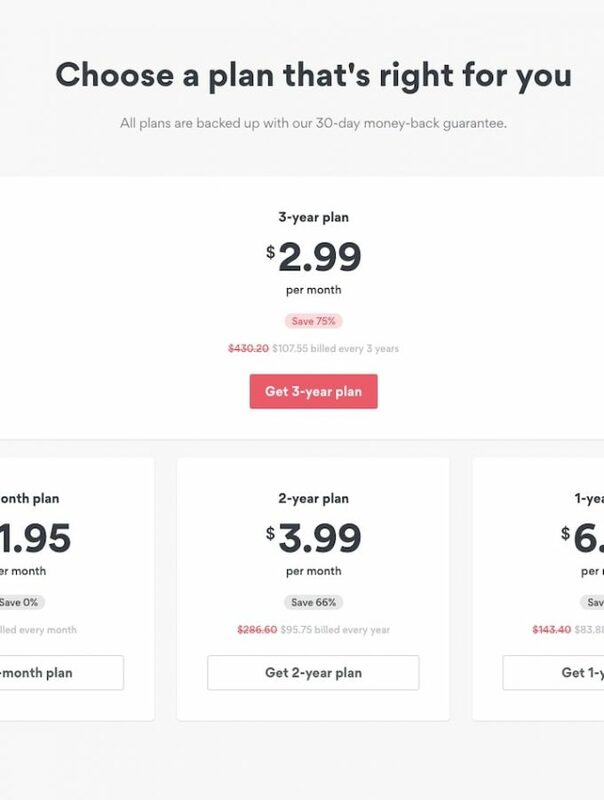 oh wow, new design! Looks good, but it took me a little bit to find today’s blog post. I recommend you to have a list of most recent blog posts in another place besides the main homepage slider  just my two cents! Bali has been on the top of my travel bucket list for the longest time. I know I say that a lot about many places… LOL, but it is true! I’ve been meaning to visit Asia in a couple of trips, but something always happens that prevents me from going. Hopefully, when I finally leave corporate America, I’ll be able to live in that wonderful continent for quite a while–including some time in Bali to learn Bahasa Indonesian! 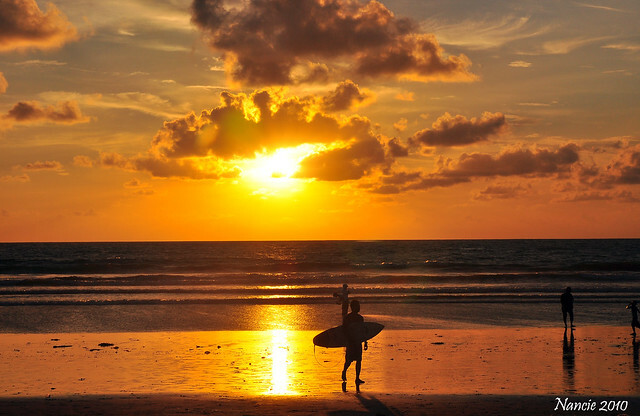 Gorgeous sunset shot- i love how you can get the outline of the surfboard. And of course, I love the monkeys! Bali is beautiful and exotic in ways that are hard to believe until you’re there. I’ve never met a people more happy with their lot in life than the Balinese — and little wonder! The new layout rocks, Nancie! Love it! Also love your photos of Bali. What a beautiful place. It’s on my list but not sure when I’ll get there. Seeing your photos, I feel like I could pack my bags and go now! The new look is nice and clean! Hopefully we’ll get to see Mr Linky again soon! Beautiful photos! 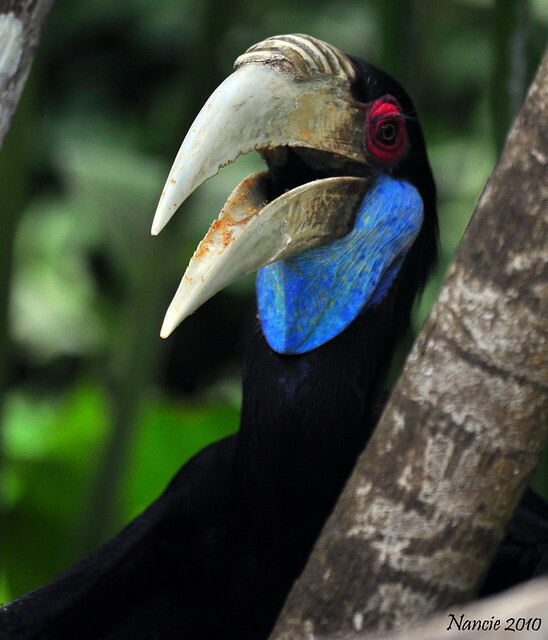 I’ve always wanted to go to Bali, especially after seeing “Eat Pray Love.” That hornbill is gorgeous. I really like your new layout too! I don’t see the Mr. Linky, but my entry for TPT should show up with CommentLuv. Beautiful Bali! I just LOVE the second to last shot of the path leading down to the Hindu temple…fantastic! What amazing photos – I loved the one of the bird catching dinner but the sunset really took my breath away!! So it’s not just me. I can’t see Mr. Linky or any of the links I have to assume folks provided. Help us, Nancie! Just wanted to add my Travel Photo Thursday link here! Thanks Maria! I was at the right place at the exact moment!